Our Big Warrior deck list guide features the best Rise of Shadows deck list for Season 61 of Hearthstone (April 2019). Our Big Warrior guide also contains Mulligan advice, card combos and strategy tips. Big Warrior is a Hearthstone deck that aims to tower over its opponents with giant and bulky minions, many of which you will have summoned onto the board for a discount - or via bonus effects - to make them more surprising or imposing. In order to reach that point, survival is your goal for the early-to-mid-game, after which you can unleash your big minions onto the board. There was a lot of excitement around Big Warrior leading up to the Kobolds and Catacombs release, but the deck didn’t make the impression many were hoping to see. 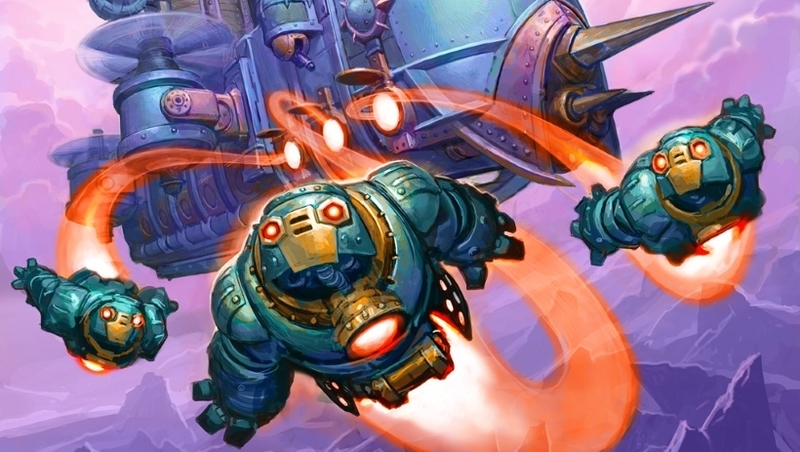 Things did improve a little later in Boomsday, but we’re excited to see whether any of the new Rise of Shadows cards can have a more significant impact on the deck’s viability. In our guide to playing this deck in the new Rise of Shadows meta, we've got a solid deck list for you to start playing with when the expansion drops. As we get a better idea of how the meta settles over the next few days, we’re going to be adding more words of advice to this guide, including Mulligan tips and more specific strategy insight. This is the most popular version of Big Warrior currently seeing play in the Rise of Shadows meta. The deck may see further refinement over the next few days so we will update the list if so! The name says it all, really. You want to play big minions and crush your opponent with them. As most of these fat creatures cost seven mana or more, however, you’ll be waiting a long time during a game until you can start to execute this game plan. For that reason, Big Warrior goes hard on the control and survival options so you can last until that point when you flip to aggression. Early game: You won’t be doing anything too thrilling in the opening moments of a game. Your first few turns will likely end up as passes or hero power uses, which is perfectly fine as there’s no need to rush anything. As your opponent starts playing minions on the board, though, look for the most effective ways to remove them. Slam, Warpath and Shield Slam are all perfect answers to this – the best option of the lot will depend if they’ve gone wide or big. Try not to use Execute unless the target is a significant threat. Mid game: Maintain control of the board as you enter the mid game too. Essentially, you’re copying the same strategy as the early game. You have a few more exciting removal tools at this stage, though. Supercollider is extremely good at hitting multiple minions, whereas Brawl can get you out of a very tight spot if your foe has flooded the board with creatures. Late game: Now your patience is rewarded as you can start to slam giant minion after giant minion onto the board. Even if it’s tempting to just chuck down whichever highest mana cost creature or spell you have in hand, you should play smart here to get the most from them. Consider which minions are still remaining in your deck before going for The Dimensional Ripper or The Boom Reaver, for example, as you may be able to find some mad value if you pull Oondasta or Grommash Hellscream. Still, at the end of the day, however you play them, all these big minions will be a real challenge for your opponent to remove. That said, don’t let yourself get too distracted by the big numbers and maintain your control game too. You’re most likely the slower deck, so don’t be afraid to take another turn or two removing troublesome cards on your opponent’s side before dropping the big minions. 1. You have so many control options available to you that you might want to let your rival play out a few additional minions before going for a board clear, just to eke out that extra value. 3. With all the Rush minions awaiting in your late game you can often get back in contention if you’ve fallen far behind on the board at the start of the match. 4. When you start dropping big minions on the board, consider ignoring trades and going just for face damage as you might kill them quicker than they expect. 5. On the other hand, if you’re afraid of their board, a quick Sweeping Strikes on any of your big creatures could leave them with nothing. 1. Don’t be concerned if the early turns seem dull. As both of your decks are generally slower, a few rounds of hero powers or passes is normal. 2. As a follow up to the first tip, control games are often lost by the first player who blinks. Don’t make a play because you feel like you should be doing something and let you opponent take initiative in the control game. 3. Always try to have a way to set up an Execute in the back of your mind. That way, when your opponent starts to drop their largest creatures you can clear them off immediately. 4. You’ll often need to find surprise finisher damage against control, so try to save Grommash Hellscream and an activator like Whirlwind or Warpath so you can hit them with unexpected burst damage. 5. In lengthy games, extra Armor and the healing from Zilliax are vital to ensure you survive, especially if the match looks like it’s going to go to fatigue. 1. Slam: Can help greatly with minion removal in the early game and also has the potential to cycle a card so you keep your hand size healthy. 2. Shield Block: Extra Armor is nice as it can be used to kill off minions using Shield Slam. Plus, you get a card draw too! 3. Dr. Boom, Mad Genius: Because of its sheer late game power, Dr. Boom, Mad Genius can sometimes be a worthwhile hold so you can guarantee to play it on curve. 4. Warpath: If you’re pretty sure you’re about to face an aggro deck then holding Warpath can be sensible as it’s a strong board clear. 5. Shield Slam: Just a strong removal card. Not a vital hold but you won’t be sad if it ends up in your starting hand. Take a bit of time to familiarise yourself with all of the core combos in the current version of Big Warrior. - Once damaged by any source - including your minor spells - even the biggest enemy minions get bought into range of Execute. You may not be able to do anything about the Deathrattles, but you'll definitely be ahead of the game with this play. - Your Hero Power can be used to boost up the strength of Shield Slam, but there's further synergy in this regard with Shield Block to find even more damage. - Warpath is an Echo card, which means you can play it as many times as you wish during the turn in question, and as long as you have the Mana to actually keep casting it. - You can get some considerable extra value out of your big minions with Sweeping Strikes as all that Attack damage will be shared across multiple targets. - If performing a little trading on the board will increase the chances of you getting a favourable result from Brawl then do so! - Supercollider is an excellent way to hit minions who might be hiding behind Taunts on in Stealth. You can apply a similar effect to your minions with Sweeping Strikes and clear out multiple targets at once. - All of your minor damage-dealing spells can also be used to trigger the extra damage of Grommash Hellscream. Beef him up and he'll be able to dish out ten points of damage on the same turn he's put into play. - The Boomship is a powerful spell that summons three minions in your hand and also gives them Rush, letting them attack other minions immediately. Keep in mind that they can't immediately attack the other Hero, however. - Akali, the Rhino can empower Zilliax, Amani War Bear and Oondasta with a huge +5/+5 buff, making this impactful minions even more threatening when they come down onto the board. - Keep track of the minions still remaining in your deck so you can better prepare for all potential outcomes when you use Dimensional Ripper or The Boom Reaver. Shield Slam: With all the Armor you can generate as Warrior this spell offers some massive removal potential that can reach all the way to massive late game minions. Execute: All your small damage spells can put your opponent’s creatures into a position where they can be deleted with this powerful removal tool. Shield Block: Generate some extra Armor to keep you alive longer while also being an activator for Shield Slam. Oh, and it draws you a card too. Nice. Brawl: Warrior’s big board clear. Can essentially reset a game if you’ve fallen behind and even leave you with the better board position. Supercollider: Turn your opponent’s minions against themselves with this unique weapon. Can also help you remove creatures hiding behind Taunts or hidden in Stealth. Amani War Bear: An absolute unit of a card. Rush and Taunt make it a nightmare for aggro decks, while it can also be buffed by Akali, the Rhino to even hencher stats. Akali, the Rhino: Synergises well with the other Rush minions in this deck by giving them a massive buff if you trigger the Overkill effect. Grommash Hellscream: One of Big Warrior’s key finishers. Make sure you have a way to activate it after playing it so you get that 10 damage in as soon as possible. The Boomship: Even if you don’t make full use of the Rush bonus, summoning three of your biggest creatures onto the board for just nine mana is always going to represent some massive value. Dimensional Ripper: Can represent a huge tempo play if it pulls basically any of your late game creatures onto the board. Another value-oriented play similar to The Boomship. The Boom Reaver: Again, simply another way to cheat out some of the deck’s biggest creatures without playing their substantial mana cost.